The PurchX app lets consumers see product information, and compare reviews and prices in one place. 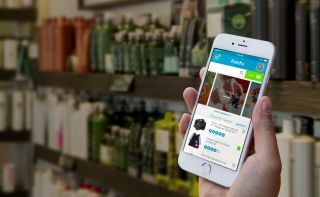 Space.com's parent company, Purch, is debuting a free new app that gives consumers easy access to information that can help them make informed buying decisions. Here's why we think Space.com readers will find it helpful. The new app is called PurchX and it is available starting today (July 14) for iOS (meaning only iPhone and iPad, but an Android version is coming soon). The app's primary function is to give users helpful product information, like lists of features, lists of comparable products, reviews, price listings and product availability (both online and in physical locations nearby). If a product has been reviewed on a Purch site, the app will link to that review. Users can call up information for just about any product under the sun, either by typing the product name into the search bar or by scanning the product barcode. We've been testing it on all kinds of random stuff, and it can be helpful when shopping for everything from toilet paper to tablets (there are more than 3 million reviewed products). As a bonus, users who leave reviews in the app can earn free stuff, and the rewards get better over time. PurchX is an upgrade to an existing app called Consumr, which was obtained by Purch in March. Users who already have the Consumr app will see the name change to PurchX when they upgrade. PurchX retains many of the basic functions of Consumr, including the user community function, but it's been given an aesthetic overhaul and upgraded with new features. The PurchX app includes an index of over 3 million products, including books, movies, toys, tech and grocery. In its present state, we've found the app extremely useful when shopping for books, movies, action figures, science kits, telescopes, binoculars and toys. I find the app especially helpful when shopping for books, which is often. I can scan a book's barcode (easier than typing) and see online reviews from other PurchX users, but also from outside websites like Goodreads. I can see what price the book is listed for online. For many products, the app also lets you see if the item is available in a store nearby. I can see items that I've recently searched for, so I don't have to backtrack if I'm looking at multiple items. On top of that, I use the bookmark function to keep a list of books I might like to get later. We're also fans of the free rewards. If users write reviews inside the app, they can randomly receive rewards that include things that start out small — like a free Coca-Cola or a free 30-day membership with GameFly. Not every review will earn users a reward, but it happens fairly often. Users can also indicate if they aren't interested in a particular reward, which helps the app deliver rewards the user does want. Purch representatives said that in future phases, the app will also offer more valuable rewards. Because the app is building on an existing app, there is already a large community of users and reviewers. The more reviews someone writes, the more points he or she will get, and the app features a user leader board. Reviewers who write a large number of reviews that are ranked highly by other users are given the status of "expert." The PurchX app keeps track of items you've recently viewed. PurchX is a particularly strong tool when shopping for tech products and electronics. With all products, users can scan multiple items and see those items compared side-by-side based on user reviews and price (the reviews come from within the app, but are also drawn in from places like eBay and Best Buy). In addition, in select categories, products are given additional rankings in a few basic categories. Laptops, for example, are graded on speed, screen quality, keyboard and touch. Then users can see how a laptop ranks among all those listed in the app. In these select categories, the app can also bring up additional products with similar features: So, if the user is scanning laptops that cost around $500, the app will bring up laptops in that price range. This feature is being extended to include more consumer electronics categories, and will eventually include telescopes, making it easier for stargazers to see how different instruments stack up (of course, users can currently search for telescopes using the app's basic function, which is still extremely helpful). For most people, it's relatively easy to look up reviews of a single product using an Internet browser, but the PurchX app brings a lot of information that would normally be found on multiple Web pages into one place. Whatever you happen to be purchasing, whether it's a telescope or a couple of new books, we think the app can be a useful tool.